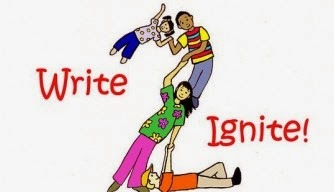 How quickly the time flies ... a quarter of the year is finished and this weekend we have Write 2 Ignite conference. How this snuck up on me, even though it's been on my calendar since last fall. But it couldn't come at a better time for me, personally. After a very busy start to the New Year with my childrens' extracurricular activities, followed by illness and disappointments, I am finally better (thanks and praise to God!) and ready to tackle the bigger projects on my plate. 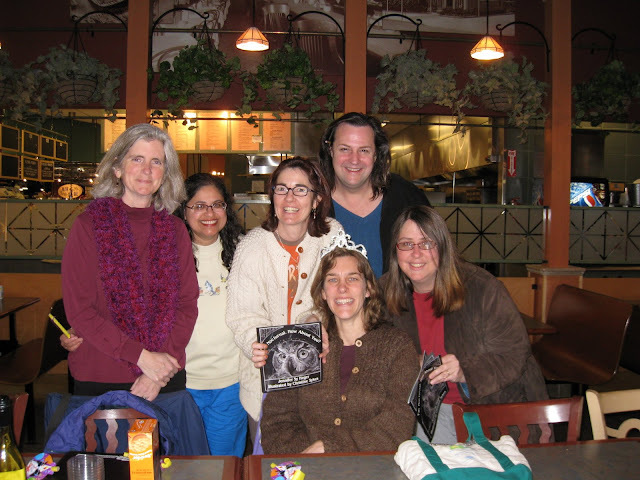 But before I do that, what a gift to be able to spend a weekend with my tribe of writing buddies. I'm looking forward to teaching and soaking up wisdom from others. This conference takes place on the beautiful campus of Northern Greenville University in Tigerville, SC and if you are interested in writing fiction and nonfiction that reflects the Christian worldview for children, this conference is a must. It's a very affordable conference, with scholarships available. I hope to see some of you there, if not this year, then next. The enforced downtime was not entirely wasted. In fact, it was a blessing. I scribbled a lot in my journal and wrote up drafts of a couple of new picture books. Never mind they have nothing to do either with my revision or the work-for-hire projects that I'm supposed to be working on ... but writers need this time to just play around. So many things that are published began just as fun little things I was playing with. I cannot stress this enough ... the time and space to daydream and play and write without worrying about other things is essential for a writing life. And here's a great video by John Cleese on Creativity. It is well worth the 36 minutes just for the laughs. The more I grow in my faith, the more I begin to rely upon St. Joseph. The Bible doesn't say much about him, but we know he was obedient to God by providing for and protecting Mary and Jesus. And of course, our blessed Lord learned His trade from his earthly father and so much more. I have often tried to imagine the life of the Holy Family, but it is in reading St. Anne Catherine Emmerich's visions that have created a fuller picture for me. No one is required to believe this, of course, it being a private revelation, but I have found it has greatly enhanced the reading of the Bible for me. Tim Drake gives a most touching tribute to St. Joseph. He ends with this: we would do well to spend time in reflection and prayer on good St. Joseph. Our culture faces a crisis of fatherhood — too many weak fathers, distant fathers, absent fathers — unlike anything we’ve previously experienced. Ask St. Joseph to bless and guide and protect your family. Take some time to contemplate what Joseph did, and ask for his intercession in your life and work. You’ll be thankful you did. St. Joseph, pray for us! To all men, especially fathers, a happy day to you! May St. Joseph pray for all your intentions. Below is my favorite dad with my favorite kids, when they were little!!! I am so thankful Michael keeps the children close to him even now. Perhaps it's the rain, or perhaps it's because it's the feast day of our favorite saints, St. Patrick, but I found myself singing this hymn, a translation of St. Patrick's breastplate, most beautifully sung by the Corpus Christi Male Chorale. It might be the best 5 minutes you spend today! A happy day to you! Folks, I have been waiting a looooong time for this. My friend, Molly, has a novel coming out in June, so I have some more waiting to do before I can hold this book in my hand. Plumb is funny and heartfelt. And vulnerable. I've been thinking about that ... where the best writing comes from. And it comes from being open and vulnerable. 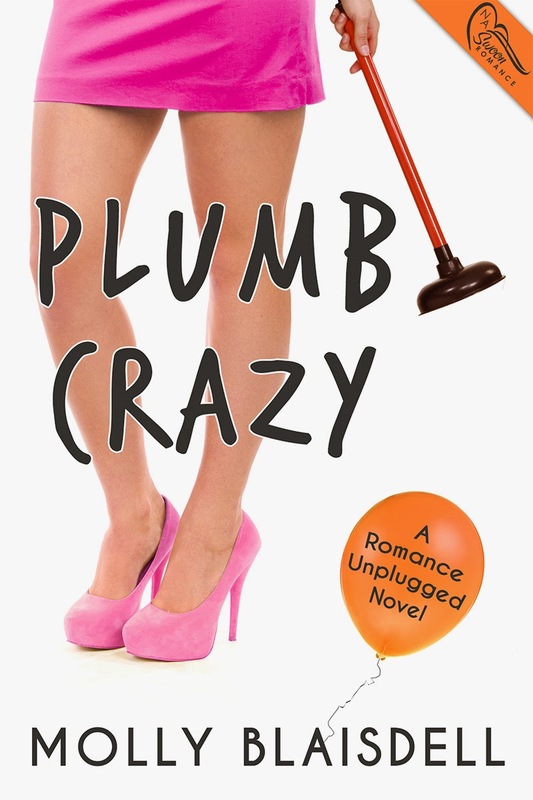 I hate to admit it, but Plumb Crazy is one of Molly's novels that I've not read in manuscript form. But I did have the pleasure of reading the first few chapters when Molly began it ... and let me tell you, she made me laugh so hard, I snorted my tea. Aside from the small-town Texas girls, there are baby goats and some serious Trekkie fanfic. There's plumbing and electricity (with a boy) but I won't say any more. I hope to whet your appetite. I remember the folks working at the deli would often look at our critique group (we used to meet at a grocery store) and wonder at our laughter and loudness as we discussed our stories. Oh, how I miss them. I am the writer I am today because of all they've shared. Molly was a huge part of my life for the most important decade of my life ... when I had my babies, began writing, and got religion. Yup, in that order. She was there for all of it, cheering me on, praying for me. And so I am delighted to give a huge shout out to Molly. Baby, this is just the beginning of your novel publishing career. I am so proud of you, for writing your wonderful stories and never giving up. Our priest reminds us there are no drive-by ashes. Apparently every Ash Wed. people ask him when they can pick up ashes. Everybody wants free stuff! 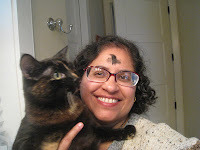 I think Ash Wed. and Palm Sunday are more highly attended than any other feast day except for Christmas. C&E or A&P Catholics, y'all are missing out on Jesus. Yesterday we had a funeral Mass for an old friend, and it was a reminder our next breath is not guaranteed. We are nothing but dust, but oh, we are God's beloved dust, and Lent is a wonderful time of allowing Him to penetrate us more deeply through increased prayer, fasting and giving. Here's a poem that one of our RCIA mentors shared with us 5 years ago. Enjoy! Fast from problems that overwhelm; Feast on prayer that [strengthens]. I met Hope Fulliam at a Highlights Workshop on Sharing our Hope. She shared a couple of prayer poems that I tucked in my notebook. Everyone present encouraged her to share these poems more widely and I am proud to say she has taken the plunge. I asked Hope for an interview and she has been gracious in answering my many questions. I hope you enjoy this conversation with Hope. 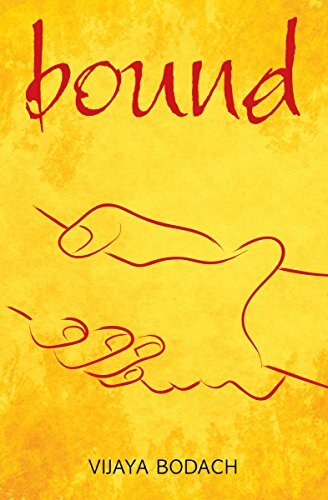 I enjoyed your book Pray Today: Christian PrayerPoems for Every Day. So many resonated with me, especially the ones about being patient, trusting in His will, and during times of distress. You remind us He’s with us always. Thank you so much for taking the time to answer some questions. I am happy to answer your questions and so gratified to know that the prayers stirred something in you. I might have written them, but they seem to have much to teach me still. The prayers in the book were written over a period of about two years. I often find myself writing prayers in my journal, but never did I think of trying to make them beautiful. How did the first prayer poem come about? 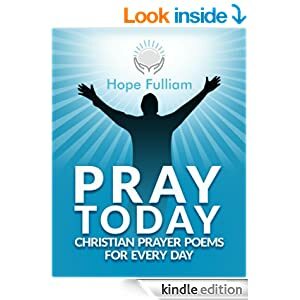 The very first prayer poem I wrote is not included in the Pray Today collection. I wrote it maybe three years ago. I didn’t call it a prayer poem at the time. For me, it was just something quirky that happened by chance one night, when I felt an overpowering need for God’s help. I wrote it and forgot about it. Were you an especially poetic child? A religious one? Who were your mentors? Please do share a little bit about your writing and faith journey. They seem so intertwined. If you call reciting “Mary Had a Little Lamb” poetic, then yes! 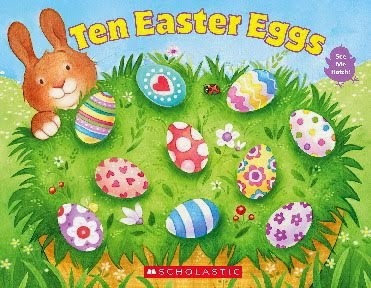 My appreciation for poetry was limited to nursery rhymes and I was not religious. As a matter of fact, I do not call myself religious now. Growing up, I was forced to attend church and I resented it. I used to sit and watch the clock creep towards the time when I could escape. And I had no mentors to speak of. I felt the urge to write when I was in my early twenties and it ate at me. I tried. I did a course with the ICL; attended workshops. But everything I wrote fizzled. The passion just wasn’t there and I never really completed anything, except a few short stories, which weren’t very good. Year after year, the frustration built. I felt strongly that I should be a writer and I knew this was what I was meant to be, because every time I told myself that I should give up, something inside me would hurt badly. In 2010, things seemed to be boiling over inside me. I was very unhappy and this worsened when I picked up some of my journals and read some old entries. All I could see was complaints and morose rambling. Those entries seemed to encapsulate my life – no joy, no achievements, but a whole lot of misery, mostly of my own making. I tried books, meditation, exercise and other things. Nothing helped. One Sunday, probably at my lowest point, I turned on the TV, trying to distract myself. I saw a preacher and my habit at the time was to immediately change channels, but for some reason I didn’t that morning. The preacher was saying that it was not too late to bring your dreams to pass. I was enthralled, glued to the words and to my seat. It was like he was speaking directly to me. I felt hope stirring for the first time in what seemed like forever. The preacher was Joel Osteen and every Sunday afterward, I sat myself in front of the TV and started to learn about having a relationship with God. Though I never reached the previous level of sadness again, my life wasn’t magically fixed. I felt almost tortured, because I had the feeling that there was something I should be doing but I just couldn’t figure it out. I felt out of place in my job and sometimes even physically. One night in 2012, I was reading a book by Joel Osteen and he said that perhaps the reason God didn’t bring a dream to pass was that we were asking too small and God had something better in mind. I kind of scoffed. I felt I was asking for some pretty huge things and I turned the page in the book, but the idea that I wasn’t thinking big enough kept whirring around in my brain. Later that night, I was writing in my journal, thinking about a prayer I had written in prose earlier in the day and about the possibility that I was missing something by not being bold enough in my prayers, and I wrote, “Maybe He wants me to write a book of prayers”. Those words left my hand hanging and set the rest of me on fire. The idea just felt right and this wild excitement gripped me. I decided to try right away and turned on my laptop. I had a couple of false starts, but once I got going, I kept going and I was awed to realize I had a prayer written in verse. Then came the shock that I had already written something like it a year or so before. I finally felt that I had found my place and the relief was tremendous. That night I told God that this hadn’t been what I had been looking for, but to please let me have it; that I would be extremely grateful and thrilled to write prayers. So, yes, for me the spiritual journey and the writing are inextricably linked. I had to find God before I could find my place in the writing world and in life, generally. And the prayers were born of personal experience – challenges and revelations and learning. I couldn’t have written them if I hadn’t gone through certain things. Bless you, Hope, for giving your testimony. I truly believe God places dreams in our hearts for us to follow. Your story confirms for me, yet again, that when we are following God’s will, we are happiest. And He doesn’t just want to tweak our lives, but to transform it. It takes great courage to abandon yourself to His will. It’s something I have to do over and over. I am curious, have you given up your work to do this full-time and are you discovering that God is providing for your needs? I did leave a job to write full-time. I do not exaggerate when I say that I might have found myself in ill-health if I hadn’t. Don’t get me wrong; I wasn’t working at some terrible place. I had a good job and I worked with good people. But I was in the wrong place. I felt caught and didn’t know how to free myself. It had reached the point where I had to force myself to go into work and some days I would leave at lunchtime and go home, where I cried for an hour before forcing myself back to the office. Not too long after, I got an opportunity to leave gracefully and I took it. Events worked out magnificently. Only one person could have planned that. It wasn’t just emotional distress that ousted me from my job. I looked at my life and saw a small person who had made no mark on this world. I couldn’t be that person anymore. Money has been a challenge. I have learnt to turn that over to God too and I no longer worry about funds. I believe He will provide in the days ahead, just as He has in the past. And another thing I have learnt is that I can ask God for anything – big or small – and I do. If He takes the time to find me a prime parking spot in a lot that’s already bursting with cars on Christmas Eve, you can rest assured that He will at least look after my basic needs too. But I tend to believe that God will provide much more than just my basic needs. Now that you are writing full time, what does your writing schedule look like? Do you write at home, or go to a café or park? What does a typical day look like for you? I write at home. I find that I cannot focus if there are other people around me. I have learnt that it is best to start writing almost directly after getting out of bed - even before breakfast. My mind is clearest early in the morning, and if I start the day by doing housework or running errands, it is hard to get into writing afterward. But every day is not the same. Some days writing is hard and there are dry spells. These are the days when it is so easy to find a host of things to do to away from my desk and I have to sternly tell myself to go sit in front of the computer. I confess that although I have dreamed of having all day to write, the few times it has happened, I've frittered it away walking the dog, browsing the net, cleaning house, and whatnot. I suppose you can say I have high resistance to writing, but I always love it when I do. Your answer is a great reminder to do the writing first thing. 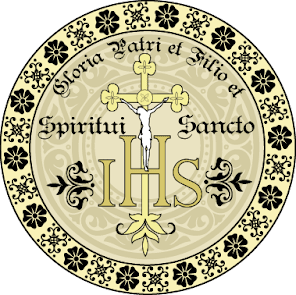 I entered the psalms by praying the liturgy of the hours. Your poems give me a new appreciation for the songs King David wrote. Have you ever read the psalms and seen some parallels with your own poems? I love it that King David was bold in his petitions and spoke directly to God and he was certainly someone I could look up to. His psalms are used as prayers by so many. I hope that one day my prayers will inspire and comfort as well as King David’s. I often sing hymns and was wondering if any of your prayer poems would fit some of the well- known hymns, like O God our Help in Ages Past, Amazing Grace, Tantum Ergo, etc.? I’m not musically inclined in the least. You are not the first to mention hymns in relation to my work and I have written a couple of poems where certain phrases repeat like a refrain to put a point across strongly, but I wouldn’t have the slightest idea how to fit the prayers to music. Then again, the fact that a person who used to dislike poetry is writing prayers in that genre is proof of God’s sense of humour. Anything is possible! Yes, God makes me laugh too! Can you share some tips on writing poems? I have no technical tips to offer because I don’t pay attention to that stuff. I’d say that writers should do whatever comes naturally. Poetry is meant to be read aloud, so read yours out loud and that’s the best way to judge if it works. So you are a natural! I am so happy you found this way to talk to Him. Would you share one or two favorite poems? My favourite prayer is “Sit with Me”. It has an amazingly soothing effect on me. From the sapping of this world, for renewal’s sake? As my tension and weariness find their release. And dismiss all the lies the enemy whispered. That looks down on malice and helps me walk above. To conquer this world with Your praises on my lips. Thank you. It is also one of my favorites because my thoughts turn so often to Him. I’m building another collection. This one will focus on perspective – seeing things from an angle beyond the obvious. I have most of the content already but I think I need at least a few more pieces. Wonderful! I will look forward to reading them, Hope. Any parting words; things you’d like to share? I hope that my prayers will touch people and encourage them to move closer to God. The prayers are meant to travel with you – to be memorized and said and used. But if my words don’t quite fit what you want to say, open your mouth and talk to God anyway. He’s interested in everything His children have to say. However, if your audience would like to purchase my collection, they can do so from Amazon in the Kindle store. And I do appreciate the support. I couldn’t agree more. The Lord loves to hear from us, no matter if they are broken words. Thank you for your time in sharing so generously. How can people get in touch with you? Thanks for having me here. People can reach me via e-mail at contact@hopefulliam.com. I would be happy to hear from them.